Paste Email Plus is a Mozilla Firefox add-on and that is one more reason why I like Firefox browser. You can customize Firefox to your heart’s content. You think of a feature that you are missing in this browser and go and dig in to the add-ons or extensions or plug-ins and I am sure you will be find one that meets your need. Let me tell you about Paste Email Plus now. Paste Email Plus is another beautiful add-on for Firefox, that would help you browse the net with fewer keystrokes and reduce the chances of potential RSI (RSI btw means Repeated Stress Injury). Chuck Baker, the guy who created this wonderful add-on calls it the Paste Email Plus. Let me tell you where you can use Paste Email Plus and how it would help you reduce those mundane, boring, repetitive tasks of filling in all those forms. Come to think of it, this cute little add-on can be used anywhere, when you have a lots of copying and pasting to do. Let me give you a few examples. A typical example is a sign-up form, without which you cannot log into a site. Generally there are a few fields like user name, email id, password. More often than not some of them ask you to enter data at least twice, either your user name or your email id. You are supposed to fill them in. Imagine if someone is visiting on an average five sites a day she has to enter at least all those details 5 times. For an individual who has more than two accounts, it would be entering the user name twice and then again the password twice. Let us presume that the user name is eight letters – abcdefgh and the password / or as some sites call it the pass phrase is again 9 characters – for e.g. : 123456789 and let us further presume that both these are made up of alphanumeric characters. The user name in this case is a1b2c3d4 and password is e5f6g7h8i, let us calculate the number of key strokes that are involved. That would be eight characters for the user name. If you use the tab button to jump the cursor into the next field that is the password that is one more stroke there. Else you would click the mouse to move the cursor into the password field and leave it there to use the key board to input the 9 characters. So how many keystrokes are you saving? Thanks to Paste Email Plus 11 key strokes in all, without taking into count all those innumerable times when you begin at the beginning when you input one wrong character and system asks you to repeat the whole process right from the first character. No worries about the safety either – because with Paste Email Plus you can encrypt the password when you first key in your user name and the password. I am yet to try this though. Go and try Paste Email Plus. You can read more about it from Chuck himself and download it here. Chuck is the same guy who gave us the add on FEBE that helps us save our Firefox profile. You can download your Mozilla Firefox here and look get more add-ons here. This is about another addon that is of immense help to those that work with words. I came across this addon a few years ago. But somehow during the ensuring browser crashes and OS hopping and upgrades and updates I missed it. Today I found it again and to my surprise I learned, Hyperwords has a version even for Chrome. Once you install it and restart your Firefox / Chrome you are all ready and set to go. When you are on the net, select any text that you need to learn more about. You will notice a small icon next to the text. Hover your cursor on the Hyperword icon and you are shown a few options. Choose the one that suits you and you are done. You can do a whole lot of things with Hyperwords addon and the text on the web. You can translate, email, share, find meanings and synonyms. It interacts with Facebook and Twitter too. Click here to learn more on their own demo page. To see Hyperwords in action on YouTube, click here. It is much more detailed and elaborate. Give it a shot. I am sure you would love it. Kyosuke Takayama says that he would prefer his Faviconize the way it is and he doesn’t “..intend to add a feature. “stay simple, stay small” in his own words. Though it is a nifty extension, the last time I checked, it had a download count of 871,611. Shows it’s popularity. For someone who has a very small screen acreage, be on her Net-book or laptop or likes to have many browser tabs open, ‘faviconize’ is a wonderful Firefox extension. It shrinks the ‘tab’ width and makes more screen room. See the image here: Look at the space those tabs occupy. “Faviconize” shrinks the tab to the size of a favicon the website uses. Kyosuke, thoughtfully added a few options too. Once installed, under Tools>Extensions> navigate to Faviconize and click on the options. One of the option is you can set a ‘default’ to a particular site to always open in the ‘faviconized’ size. The other option is, you set a key board short cut of your choice. Yes, of course I am using it. You can add “Faviconze” here. Download the latest Firefox here. Sandeep, take me to this url! When you are on the net, there are many instances where you come across web URLs that you may visit. You need to copy the url and then paste it in the address bar opening a new window or a tab to visit that site. Sandeep Kothari came out with a solution. He created a Firefox extension for folks like us. His “Take Me To This URL” does precisely that. Once you install “Take Me To This URL” extension, all you have to do, when you come across a website text link is, select it and right click to show your context menu. In the context menu you will find, “Take me to this URL”. Point your cursor at it and click! Bingo! 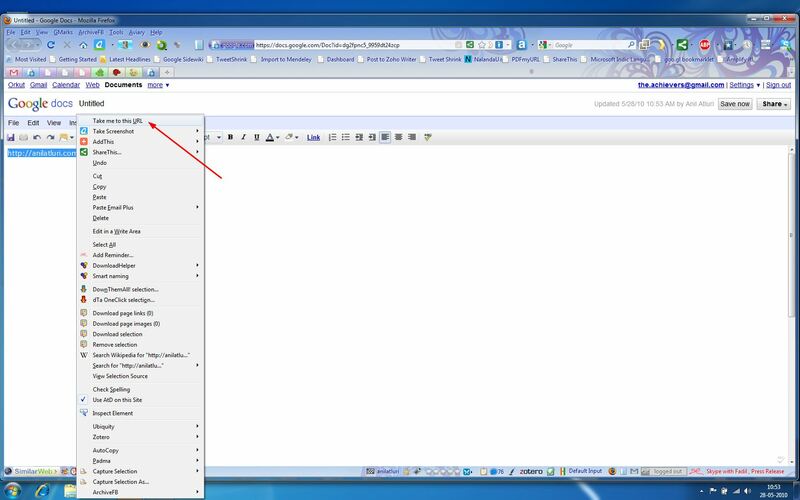 The plain text URL to the selected website opens up either in a new tab or a window depending on your browser settings. Click on the image to see detail. You can download the Firefox extension “take me to this URL” here. © 2019 Show. All rights reserved.